One thing I have always worried about since I have had Lily is waking her up by needing a trip to the bathroom in the night. Lily has never been a big sleeper and its only recently that she has started sleeping through on a regular basis. In my last flat and my new home, both bathrooms have pull cords that make a loud CLICK noise as you pull them. Sometimes I would just get Lily back to sleep and would need to use the bathroom before hopping back into bed and I would attempt to go in the dark. Well now I have that problem no more. 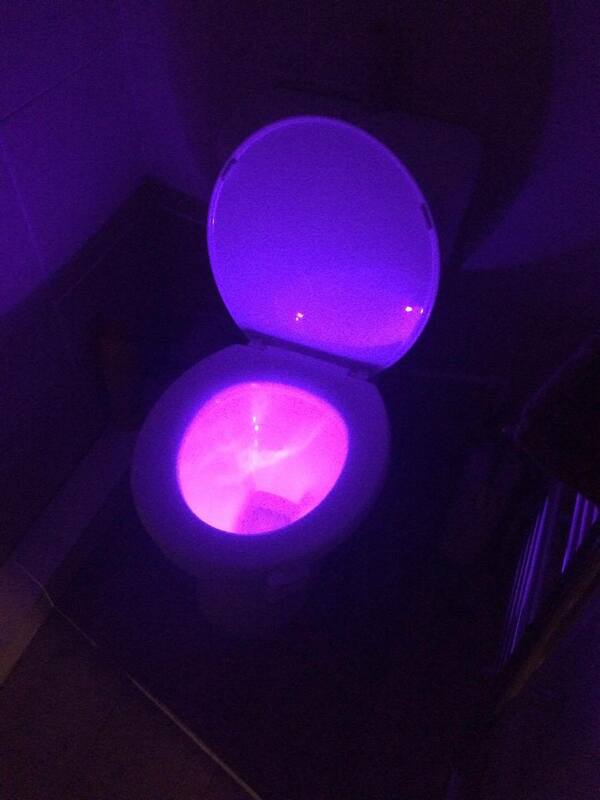 There is such an invention as a Toilet night light and Illumibowl sent one to me to try out. 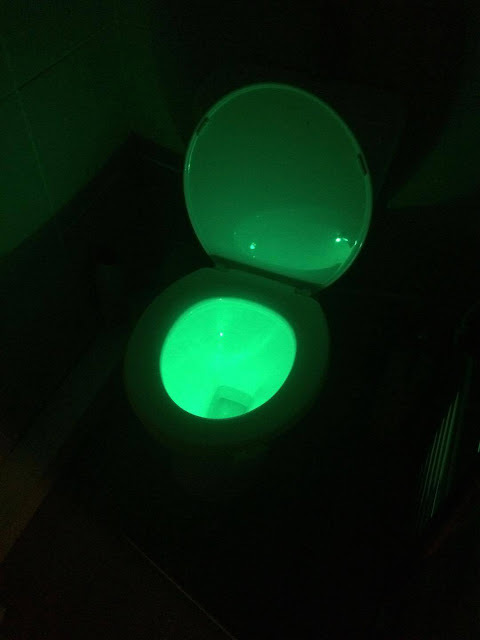 The idea behind it is that you place it onto your toilet and when you enter the bathroom the motion detector turns on the light which illuminates your toilet bowl. Meaning you don't have to switch on your bathroom light. It comes in 8 different colours which rotate. Red, Orange, Light Blue, Green, Dark Blue, Purple, Dark Pink and Pink. They stay on for 2 minutes after the last the last bit of motion was detected. When you are in the bathroom and the light is on. The Illumibowl will not light up. Saving you in batteries. It fits onto any toilet and has a special stay put arm that keeps it in place. Firstly I think the idea is brilliant. No more making noise in the bathroom and secondly, no more being fully woken up by a bright light. Though I must admit, out of habit a few times I still have pulled with light switch. It is something Im going to have to train myself not to do. The light fits on the toilet really easily. Didn't take me 2 moments to install it on. It also stays on the toilet really well and it hasn't come off at all. Which is great. The quickness that the light comes on when you enter the bathroom is really good, and it is really bright so you can easily make your way to the toilet. In fact my bathroom isn't to big so most of it was lit up. The only time I found the light not to great was when it was on the colour red. Red is a really hard light to see in and as its also the first colour to come on, so it is the colour that you are making your way to the toilet with. I really wasn't keen on the red colour and would of preferred it not to have been included. I think it also looked slightly demonic and freaky. Its not really what you want to be walking into when you have just woken up. Especially when you may have been having nightmares which I can have quite a lot. But all the other colours worked really well and they softly and slowly rotated from one colour to the next. So don't worry, it won't be like a disco in your bathroom. Overall this product is well worth investing in. You can buy it for £14.99 from the website. 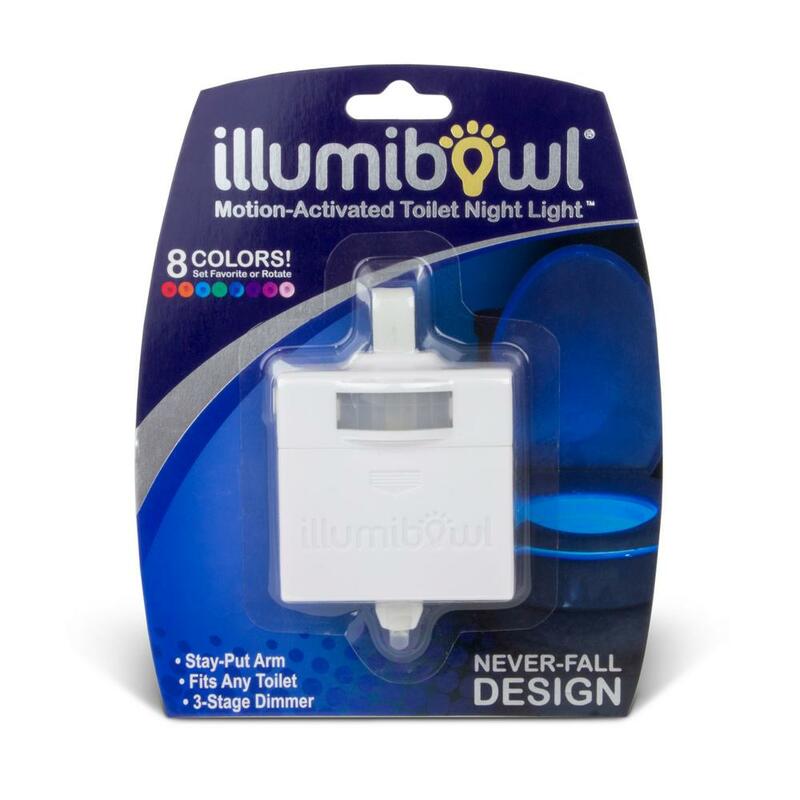 If you would like to give this a try then why not Enter below to win a Illumibowl Night Light. Forget the kids I would love one! I like the green one -it is quite sci fi like! I love the blue. Thanks for this very handy giveaway, I would love one of these, so useful for my kids. I think green. Its quite cool and calm. Brilliant! Love the blue and also the green light. I'd choose blue as it lights the loo enough to see but not a bright light to wake up my little one on his night time bathroom trips. This is just the job in the middle of the night so you don't wake the kids up. Blue would have to be my favourite colour. I would have the blue! I think it has to be green as that is my favourite colour. What fun this gadget is. I like the green best. Foget the kids, as an adult I love this! The pink/purple one is fab! The green! These are amazing ! I dont know how I've never seen them before, and funnily enough me and my eldest had a discussion about going to the toilet alone last night! this would be handy for my son aiming in the dark! I like the purple light. The dark blue is the one I like the most. I think the purple would be my favourite. Green, I would feel like an extra in the Ghostbusters film. I love the purple and it would match my bathroom! My favourite colour of light would be purple. Love the purple but bet red is pretty cool too! I really like the purple.